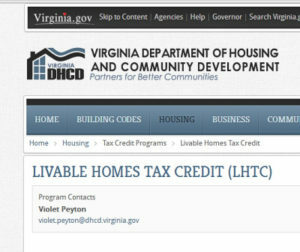 The Virginia Livable Home Tax Credit (LHTC) program is designed to improve accessibility and universal visitibility in Virginia’s residential units. It does this by providing state tax credits for the purchase of new units or the retrofitting of existing housing units. Tax credits are available for up to $5,000 for the purchase of a new accessible residence and up to 50 percent for the cost of retrofitting existing units, not to exceed $5,000. For more information about the Livable Home Tax Credit program, visit www.dhcd.virginia.gov/LHTC or call (804) 371-7124.